This new online slots game takes as its inspiration one of the world’s most fascinating and beautiful creatures, the butterfly. 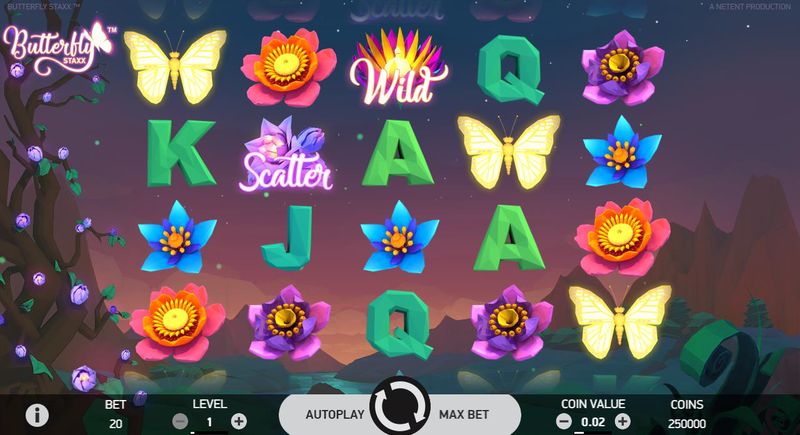 Developers NetEnt have crafted an online slot game that is a visual delight, incorporating butterfly graphics to dazzle and delight and drawing on the kaleidoscope of colours that mark these extraordinary animals. With the action taking place on 40 paylines over 5 reels, there is ample opportunity here to win big while being dazzled by the beauty of butterflies in Butterfly Staxx. Get the best out of new slot offers online before you play the game! We have even more games from Butterfly Staxx on SlotsBaby for you to check out! For 20 years, NetEnt have been at the forefront of providing online gaming solutions to some of the web’s biggest casino brands. With offices in Sweden, Malta, Ukraine, Gibralta, Poland and the USA, the team of skilled and dedicated developers consistently deliver games that delight fans and push the boundaries of innovation in the online slot machine world. Fully licensed and compliant and listed on the Nasdaq OMX, NetEnt’s award-winning range of games titles includes Hall of Gods, Finn and the Swirly Spin and The Legend of Shangri-La: Cluster Pays. 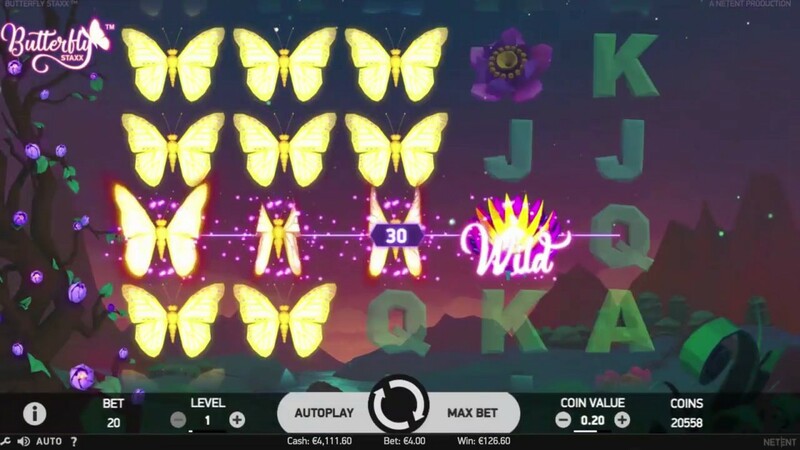 From the moment a player enters Butterfly Staxx, they are immersed in a bright and beautiful butterfly world that transports the gamer with engaging and enchanting sights and sounds. A minimum bet of 10p is required, but after that players can stake as much as they like, making this the perfect gaming option for fun or for more serious online slot machines gamers. The action takes place over 40 pay lines and on 5 reels, meaning players are drawn into to an exciting and quick to learn gaming experience. Wilds – These can appear anywhere on the reel and will substitute for all symbols with the exception of scatters. Wilds appear both in the main game and on re-spins. Re-spins – These are activated when a stack of butterfly symbols covers one whole reel. All the butterfly symbols move to the leftmost position on the same row not already occupied by a butterfly, where they remain until the end of the re-spin. Any butterflies visible on the reels then move again to the leftmost position, winning the player another re-spin. This process continues until no more butterflies land during the re-spins. Butterfly Spins – If a player finds 3 or more scatter symbols appearing anywhere on the reels, they activate this round. Only the cocoon symbols can land during this round, and active ones turn to butterflies, flying to the leftmost position on the reel. All bet line wins are added to the total win.